Written by Rosemarie Parent from the Arrow Lakes Historical Society archives and their book “Port of Nakusp”. In the early history of Nakusp, the Jordan family played a big part. Frederick William Jordan left his birthplace in England to go to India, where he apprenticed in dry goods for a British company. However, he contracted malaria and had to leave for a more temperate climate. He obtained letters of introduction to a man in Victoria, where he found employment in a saw mill. His reputation as a dry goods man was brought to the attention of John Andrew Mara, MP for Yale, who had several general stores throughout BC. 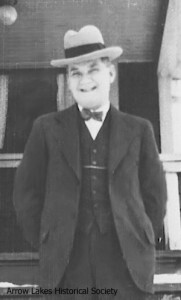 Fred ended up taking positions in Wood and Tunstall stores in Victoria, Vancouver, Kamloops, and finally came to Sicamous, where he became the manager in 1890. While in Sicamous, Fred learned the fur buying business, developing a keen eye for pelts of quality. He also became skilled in the Chinook language, a jargon trade language used between Native tribes in North America. The language changed considerably with the coming of the white man and the influence of French and English. While Fred was still in Sicamous a young lady named Blanche Howell visited her uncle, Sommes Appleby, who worked there as a station agent. Just 18-years old at the time, her youthful beauty caught Jordan’s eye and they were soon married. John Mara had decided to open a store in Nakusp and offered Fred the job of manager in this new store. At the time the Leland Hotel, the Madden Hotel (later named the Grand), and the Nakusp House were build but were not yet too accommodating, especially for omen. There were no rooms available at the Leland, the better of the three. Dr. Williamson insisted that the newlyweds take his room. Fred pressured his carpenter to complete the store so they could move in there until part of their new home was built and could be occupied. Jordan quickly became an influential businessman in town, and was also appointed Justice of the Peace. There were many bachelors in residence but few families. During the worker’s free time, disputes would erupt between different nationalities. Fred continued to take on various community positions. In September of 1894 two lots were donated to build a school. Fred was secretary of the new organization which took on the task of completing the building arrangements. Life was not all rosy for the Jordans. In 1894 the couple lost their first baby. With no doctor in town they had decided to go to Mara, where her aunt lived. It was a wintry March when they left and the only boat available was the Arrow, and it could only take them to Greenslide. They had to walk in the bitter cold for a good distance before a team and sleigh from the Arrowhead and Revelstoke construction crews picked them up. They got a train at Revelstoke to go the rest of the way and stayed with her aunt until the baby was born. Blanche suffered from the trip and the baby died three days after birth, on May 5th. Happily on November 26, 1896, Blanche gave birth at home to a son. He was named Howell, which was Blanche’s maiden name, and he lived in Nakusp all his life. As babies were born to other pioneer couples, the new children changed the atmosphere of the little town. The rough edges of frontier life gradually rounded off. The first girl born in Nakusp was the Jordan’s baby, Florence, in July of 1898. She also lived in town all her life, enjoying the lake and the Minto that she loved so much. The family continued to grow, with George born in 1900, Grace in 1902 and Fritz in 1904. They were all born at home with the help of Dr. Brouse of New Denver, who sometimes made the trip by handcar. 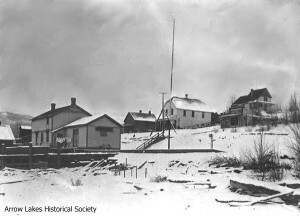 Station, Jordan Store and Jordan House. Fred Jordan’s general store business also continued to grow. He stored his goods at the CPR warehouse. It was a large building located right next to the station, complete with an elevator. He was now able to get carload lots of goods at a time, saving him money. Fred Jordan’s brother, George, had bought 160 acres of land in Fire Valley (Edgewood) in 1891. He tried to build a ranch there but decided to sell out and go to the US. Fred Jordan bought the ranch from him, because he felt George would return some day. When he did, he would be able to give his brother a job in his business. 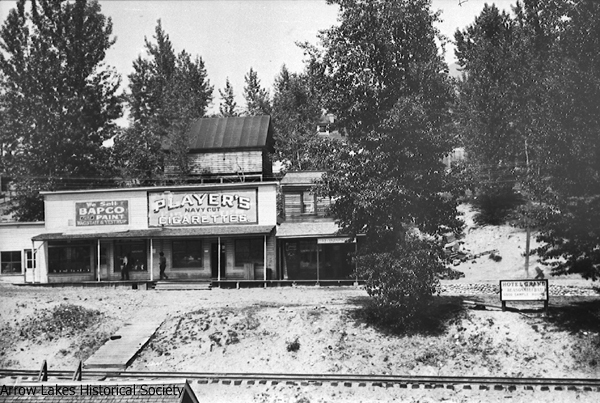 In 1905, the social scene in Nakusp was improved with the formation of a drama club. Fred and Blanche were participants, and with many new people coming to town the club grew. Modest productions were held in the Woodsmen’s Hall. This was on the top floor of Tom Abriel’s office building, where Wylie’s Pub is now situated. The Jordans were also involved with the formation of several organizations in Nakusp – the Knights of Pythias, the Canadian Order of the Woodsmen, and the Masonic Lodge. 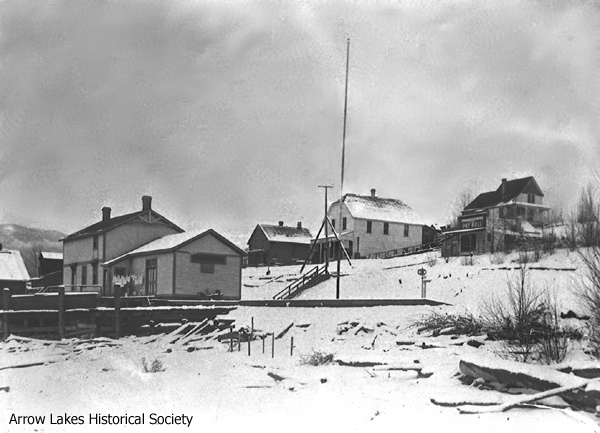 In 1909, the businessmen of the town formed the Nakusp Board of Trade, the forerunner of the Chamber of Commerce. Fred Jordan became the first president of this busy organization that looked after so many community affairs. As Fred Jordan had predicted, his brother George came back from the US bringing a bride, Maud, with him. George built a men’s wear store on Bay St., a move the Fred encouraged him to take. George also built a house up on the hill. There were no children from this union. Fred Jordan’s family continued to grow with Ron, born in 1907, Miriam in 1908, Cecil in 1909 and Winnifred in 1910. At this time, the Dutch caretakers Fred had hired to care for the farm in Edgewood left to start a farm of their own. Blanche persuaded her husband to let her run it with her mother’s help, and with the children to help with the chores. 1918 was a sad year. The Jordan’s son, George, contracted typhoid fever at the age of 18-years. His sister Florence, who was a nurse, came in to attend him, as did a doctor from Revelstoke. However, nothing could be done to save him. He was sadly missed by family and friends. Then in 1921, Fred Jordan suddenly died. The man who had always been there to help others with every aspect of the town’s growth was gone. His true worth was probably not really appreciated until he was gone. 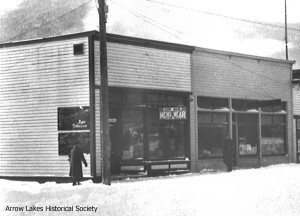 Fred’s son Howell moved the Jordan store to Slocan Ave. late in 1922. This was also the time of the fire on Bay Street, when many stores were lost. Because they had to rebuild anyway, many decided to relocate to Broadway Street, where several other businesses had been built recently. The beautiful Masonic building had just been completed and the post office which had been on Bay Street, was moved to the east side of the lower portion of the Masonic building. George Jordan realized that with so many businesses moving to Broadway, he would have to give up his store on Bay Street. He didn’t want to leave this spot, with its beautiful view, but felt he had no choice. With James Vestup, his former neighbor on Bay Street, they decided to build a block large enough to house both a men’s wear and a hardware business. These stores opened late in 1922, in time fro Christmas. George kept this store until 1937, when because of illness he sold out to the Jupp brothers. He died June 4, 1941. Although many years have passed, the Jordan name still carries on both in Nakusp and Edgewood. Men like Fred Jordan and Thomas Abriel contributed much to help keep the town going successfully in times of little money and rare help from the government of the day. They deserve all the respect and honor they still received.